Today I would like to introduce to you two new ingredients that you probably wouldn't normally cook them on a regular basis. These are goji berries and enoki mushrooms. The goji berries have been getting attention recently. There are more and more health stores and supermarkets starting to carry goji berries. 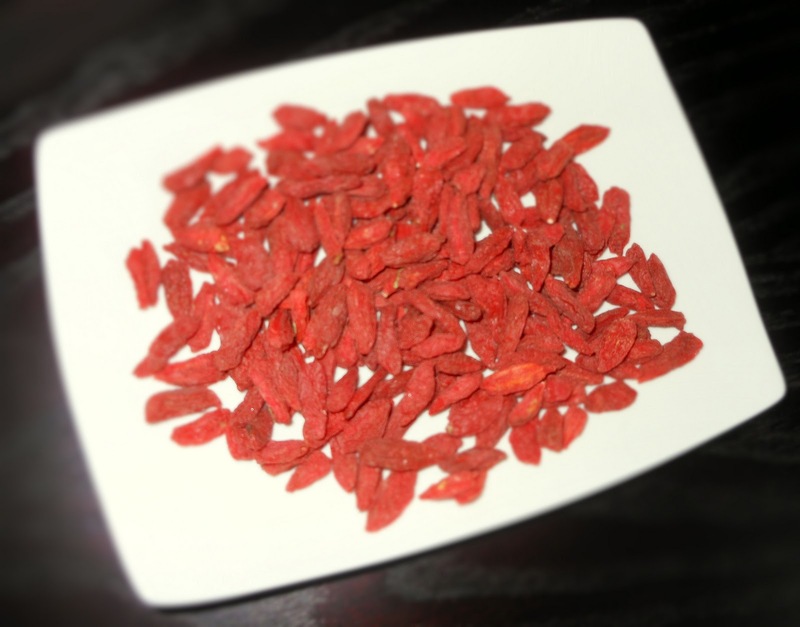 Some studies show that goji berries contain antioxidants and have lots of health benefits. For those who have never tasted goji berries before, they taste sweet and tangy which are similar to the flavor of cranberry. 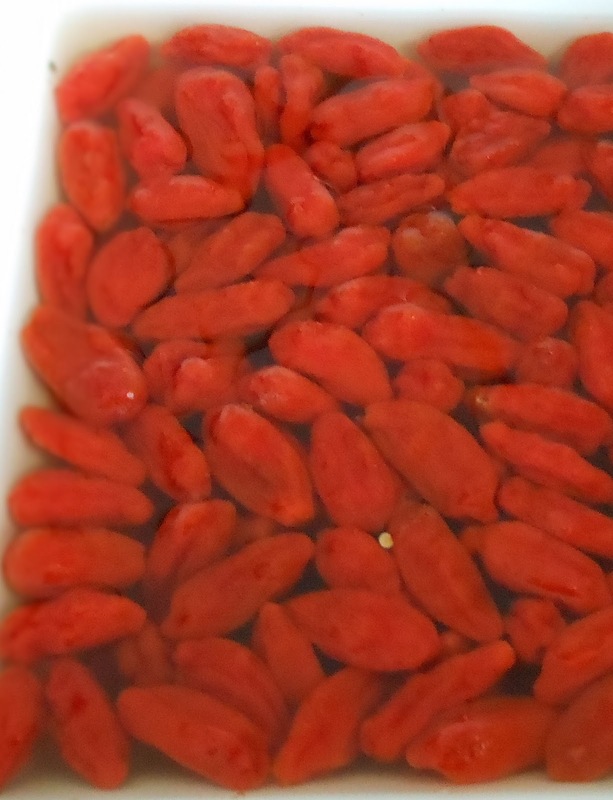 The goji berries are usually sold in a dried form. You need to wash and soak them in warm water for a few minutes before you use them for salad or other dishes. You can make a hot drink by steeping the goji berries in the boiling water for a few minutes. In the future, I will introduce more recipes to you using these amazing goji berries. 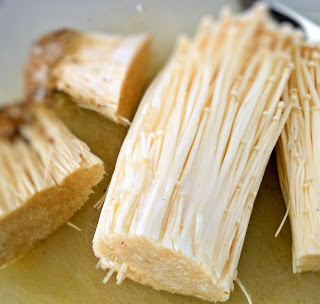 For the enoki mushrooms, you can find them fresh or in cans in some of the Asian markets. I prefer the fresh kind because they contain a delicate flavor which you can hardly taste it when they are in cans. Wash and pat dry with paper towels before you use them. The lower part of the stems should be trimmed off. Also, try to separate them if they are all attached together. My experience is that you can get choking by putting a whole bundle into your mouth. For me, I even cut them in half crosswise, so that accidents can be prevented. Hope you enjoy this new recipe. Saute garlic. Add cabbage and stir-fry for about one minute. 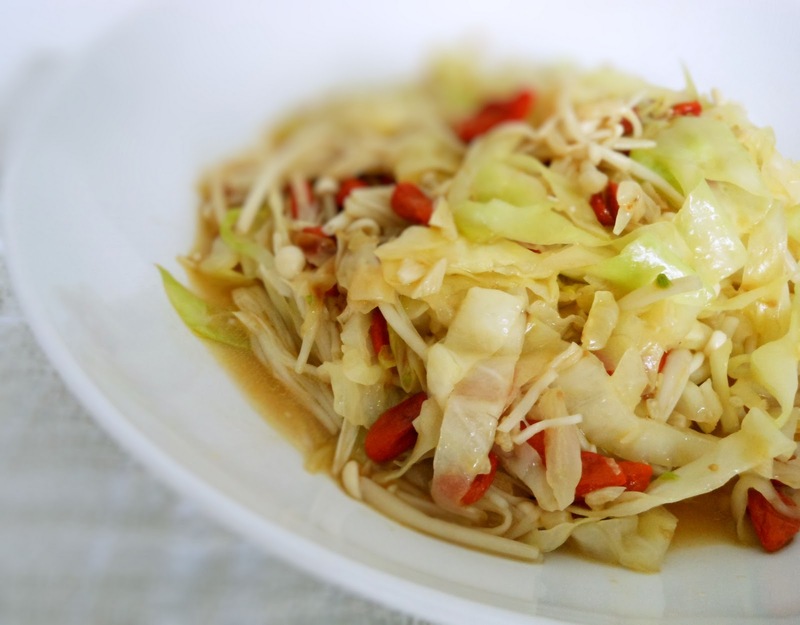 Add vegetable broth and goji berries to the cabbage. Cook until cabbage becomes translucent. Add enoki mushrooms and mix well. A very creative & healthy dish! I used to cook goji berries in soup only. it looks delicious and I recall a few restaurants have main courses made from goji on steamed chicken, or with stir-fry baby bok choy. Jacque, have you tried goji berry muffins? They are good. Thank you, Nami! Happy holidays to you and your family too! I'm going to try the cookie recipe that you just posted today. The picture makes me mouthwatering. Wow so healthy recipe! Thanks for this yummy recipe. I will try it at my home as well as i know the benefit of goji berry. These berries may help improve your immunity system, to prevent aging, protection against some deadly diseases and can also help to take care of sleep disorders.